Old friends | Curly's Corner Shop, the blog! Any sightings, please pass on to William Hague. No one will ever know to what extent the building of a bridge with Libya has assisted in monitoring the production of chemical and biological weapons in that country. Nor to what extent intelligence was provided that would otherwise have been lost to the current rebels. Nor to what extent the Lockerbie bomber would have been able to be prosecuted. It would be incredibly easy to criticise the current governments posturing on Libya, particularly in light of other extreme Arab states that have had an easy ride from them. I sense a bit of ‘wow wasn’t Cameron good here’ I’m not so sure. The above post, which seeks to sneer, at previous government intervention, being published at a time when many Libyans have and are suffering, again show the lack of judgement and care that Curly, has so often engaged in. Unfortunately, this blog is like a rollercoaster one minute engaging in a good debate and the next diving into immaturity. Curly, this is very poor judgement and ill timed. I hope and pray that the suffering of the Libyans does not endure for too much longer. However, as a person who was once asked to contribute to this blog, in all honesty, I cannot. There emanates an element of ill researched, ill judged and plagiarised, hyperbolic publications that frankly, are often insult one’s intelligence. There are some very good contributors to this blog who I am pleased bring some common sense and good debate. However, this inappropriate item on a day when it is assessed that over 400 people were killed in the last three days is the final straw, making light of the current catastrophe to people’s lives. Should you feel this is not ill judged Curly then you will not need to defend your stance. You will not hear from me again (I think Curly will be pleased) I will seek debate at a more civil level. Zing! That’ll show the middle east peace envoy! Can you also do Thatcher meeting Pinochet? 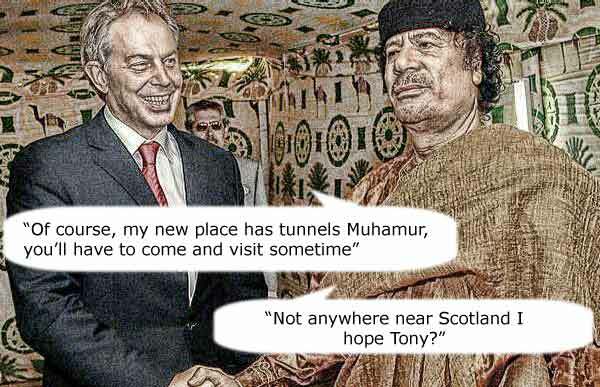 Or Prince Andrew meeting Gadaffi whilst being accompanied by a 17 year old girl? Or Cameron meeting Saudi royals to discuss weapons sales? I don’t think there’s yet been a UK government that’s had a problem with sacrificing principles and human rights. It was ever thus, “realpolitik rules ok”. Eventually, even the most terrifying dictators and their wrong doings are treated humorously, sad, regrettable, obscene, but true. Kevin, please don’t desert us, without you and Brian this blog would not be worth much attention; although there have also been some good contributions to the twit ter and “Monkey” posts. I have been criticised and, on occasions, ridiculed, by some contributors (U2 being honourable exceptions). Don’t be too hard on Curly, he is provoking you. Thank You Brian, for noticing the labels and tags below the post, and the fact that this is an even handed satire which has a go at our Foreign Secretary too. You are entitled to be catalytic and provocative, Curly. As previously stated I feel that this blog will inevitably be poorer for the loss of Kevin, so please reconsider. I would appreciate it if Kevin provided links to those other forums where he posts his blogs. As regards Libya just what does the future hold, and, who is going to provide resources and finance the rebuilding, given that parts of the UK urgently need regeneration and investment. Imagine the boost to the NEast if money spent supporting Libyan rebels had been used to preserve One North East and create additional Enterprise Zones for the region. Meanwhile, depressingly at local level the tweet content of certain of the twittering councillors and their admirers and detractors does nothing to inspire local residents with any confidence; imagine if a low, say 20% turnout, by a” disinterested electorate” results in a Police Commissioner or Mayor of similar ethos and character as revealed by their tweet content being elected. Well, when I do write the odd post I have to try and write in a style that provokes some reaction and discussion. It would be a pretty bland blog if we all agreed on every point that I presented. This does not mean that I intend to provoke any individuals who come here, but simply to garner all of your thoughts and reactions, and yes you will find lots of silly and seemingly immature posts in this blog. Curly, instead of writing posts you could save loads of time by just building a list of tags and labels to get your message across. The world would be a sadder place if bloggers were unable to caricature, parody, and satirise our political leaders, some people need to get a life, and a humour transplant. the Libyans will be able to join in this fun shortly (then we can sign the contracts to rebuild the place before the Yanks jump in).